deleted Finale and Sebeilius music scores. Recover My Files is the complete data recovery solution. To see the list of other file types that it will recover click here. Recover My Files will retrieve files lost in an accidental or deliberate file deletion, the accidental format of hard drive, virus or worm infection, unexpected system shutdown or crash, and software failure. This program makes data recovery files easy. Recover My Files requires no special technical skill. It is easy to recover deleted music and video. Download the trial version and give it a try. Recover My Files is compatible with all versions of Microsoft Windows and Microsoft Office and works with FAT 12, FAT 16, FAT 32 and NTFS file-systems. Recover deleted files from Jaz, Zip disk and other removable drive formats. 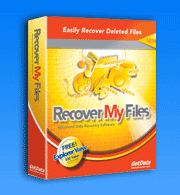 Recover My Files completely automates all aspects of the file recovery process.